Fellowship placements are based on language ability, fellows’ experience and the needs of country programs and regions. CRS seeks candidates who will be strong leaders, regardless of their geographic or sectoral preference. Below is a map and a list of countries showing where fellows have been placed in the past 5 years. Fellows move in to a variety of positions upon successful completion of their fellowship. 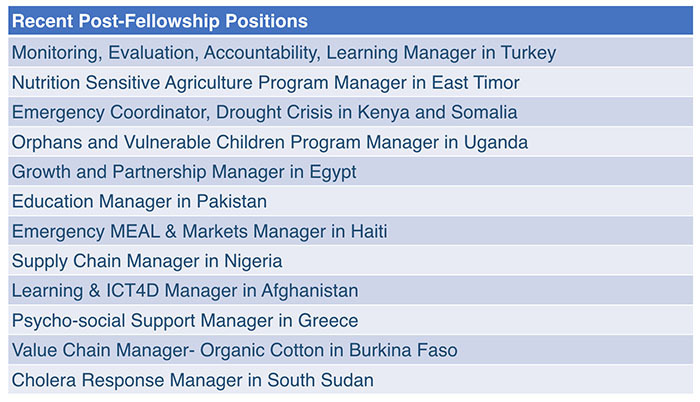 Fellows apply for specific positions, based on their area of interest, background and skills. Below is a list of recent positions that fellows have assumed—spanning several sectors in programming, operations, and regions around the world. Since 2013, the IDFP team has collaborated with the Humanitarian Response Department and country programs responding to emergencies to send fellows on emergency temporary duty assignments. These TDYs generally take place between January and May, after fellows complete introductory learning on emergencies and participate in a preparatory webinar. The emergency TDY is an excellent opportunity for fellows to learn how CRS responds to emergencies, gain initial emergency experience, and contribute to emergency needs. Efforts are made to provide emergency TDY opportunities to interested fellows.